Newly opened in Addo, Adrenalin Addo is a family friendly attraction for those in pursuit of sheer fun and adventure. 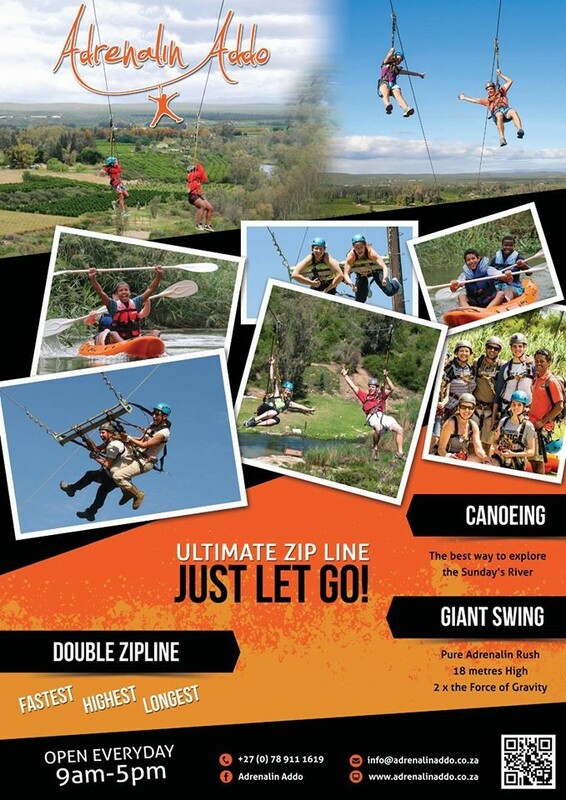 Proud to lay claim to the longest double zip line in Africa and the only giant swing of its kind in South Africa. If exhilaration and an adrenalin rush are what you are after, neither activity can fail to disappoint! 500m long – 60m high – up to 60km/h, fast, fun and safe, this exciting ride begins from a vantage point 60 meters above the Sundays River, overlooking a valley of citrus. Brave enough to take that initial launch, 500 meter twin zip lines fly two riders over the river at up to 60 km/h. An automatic breaking system at the end of the zip means you do nothing but enjoy the ride! 18m high free fall– twice the force of gravity, adrenalin Addo’s Giant swing is the first of its kind in South Africa and guarantees to swing you to new heights. After being hoisted up 18 meters high, the rest is history as they say. A release into oblivion, the sky your limit, this is the ultimate test. Say goodbye to your stomach! Or for something more sedate, hire a canoe and paddle the waters of the Sundays River or hike up to the lookout points and enjoy the breathtaking views of the surrounds of the citrus rich valley. Adrenalin Addo is open every day of the week from 10am to 5pm and bookings in advance is strongly recommended. For more information contact Adrenalin Addo at 078 911 1619 or email at info@adrenalinaddo.co.za. Or better yet, visit the Adrenalin Addo website to tantalize the adventure junkie in you.